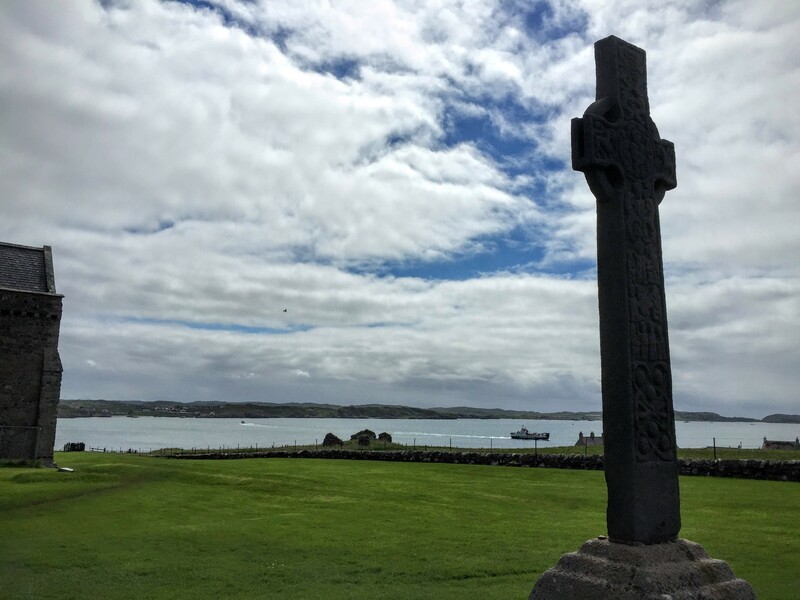 During this past month of July, my wife Rebecca and I spent a week at Iona Abbey, a monastery dating back to the 7th century on a small island off the coast of Scotland. 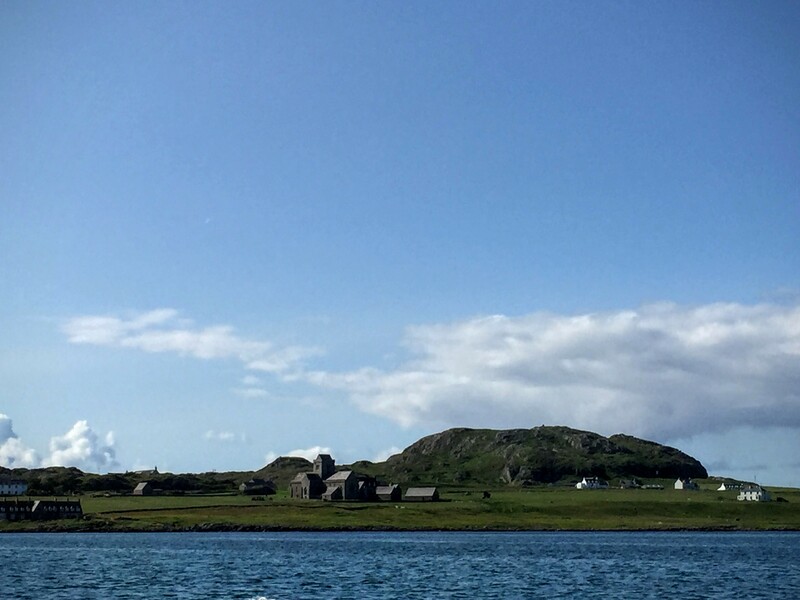 The highest point on this island, called Dun i, is right next to the Abbey, and one afternoon we climbed this small “mountain” (only 330 feet tall, or so) to get a better view. The view was pretty spectacular, but that wasn’t what struck me most. What was most striking about being on top of Duni was the wind. We sat down on a rock facing North, and the wind was whipping around us, as is often the case when you are at the top of an exposed height. But there was something else that I hadn’t experienced on other mountains. The wind was causing the rock beneath us to vibrate in such a way that it felt like the mountain was breathing— there was a steady pulse beneath us that felt like the rocks themselves were alive. In Hebrew, the language in which much of the Bible was originally written, the word for “wind” is also the same word for “breath” and for “spirit.” And in that moment, it was not hard to understand why. And it was also not hard to understand why Jesus might have gone to places like mountaintops to seek God. Just before our reading from the Gospel of John this morning is the famous story of Jesus feeding 5000 from five loaves and two fish. After this miracle, John tells us that the crowd is so enamored with Jesus that they want to immediately start a revolution and make him their king. Jesus has different plans, however, and so he flees to a mountain to be alone. When the people find Jesus again in our reading this morning, he’s on the other side of the lake and is downright prickly with them. He pretty blatantly accuses them of only wanting a divine vending machine — you’re only hear because I gave you bread last time and you’re hoping I’ll feed you again. You’re using me to get something you want, that’s all. And in the cryptic way that John writes his gospel, Jesus hints that there is something much more meaningful on offer that they should be hungry for: the bread of life. The story challenges us to think about what we are looking for from Jesus. Are we, like these people, here only for our own self-interest? Do we merely want to be fed or do we seek this mysterious bread of life. Being on Iona was a great time for reflection. Some of that reflection was personal — as Rebecca and I prepare to move to Rhode Island, I am reflecting a lot on what my next steps should be. But something else that occupied a lot of my thoughts that week has to do with the very nature of faith. Iona Abbey was one of the most significant centers for what we might now call “Celtic Christianity.” Though they didn’t invent the famous Celtic Cross — that cross with a circle around it frequently decorated with swirling lines — the monks at Iona may have been the first to build them out of stone to create monuments and markers. And the famous Book of Kells, a beautiful hand-drawn copy of the four gospels decorated with vivid swirls and illustrations was created at Iona, along with many other similar works. Given all this, I thought it appropriate to read as much as I could about the “Celtic Christian” tradition while I was there. The very first thing that struck me as I studied and as I lived in this community was the extent to which their faith permeated every other part of their lives. The ancient Celtic Christians had prayers they would say as they washed their face in the morning, blessings they would offer over the flour as they kneaded bread, more prayers for drawing water from their wells, and countless other short blessings for every moment of life from rising in the morning to laying down to sleep again. Now, this would not be totally unexpected from a bunch of monks. But actually, it wasn’t the monks that invented or used most of these prayers. It was the people. For the average, everyday people of Scotland and Ireland, faith permeated and mixed into every moment of their lives. This was very striking to me because it stands in sharp contrast to the conversation which is dominating most Christian denominations in America today: how do we adapt and change to a society that is no longer “Christian” the way it used to be. Most of the discussion focusses on the changes in our society that have moved religion out of the center of our cultural and public life. Observing this trend, the conventional wisdom is usually some variation on “we in the church need to change in x ways to stay relevant in our changing culture.” The solutions or partial solutions cover a range of topics, from more “cosmetic” changes like musical style or using a projector screen instead of hymnals, to “business model” changes like reorganizing our leadership or accepting electronic donations, to “attitude” changes like encouraging pastors to spend more time in public places than in their offices or making a renewed effort at community engagement because we can’t assume people even know what church is anymore. Of course, there are ways in which the church may need to change in our changing society. I won’t argue that point, and a lot of the changes I just mentioned are ones that I support. But I can’t help but wonder if we shouldn’t question the assumption that the church needs to catch up. What if, actually, we in the church were leading the way? And I don’t just mean leading the way on particular issues — though I think we should absolutely do that. But what I really mean is leading the way in modeling a different cultural ethos altogether. Paul’s letter to the Ephesian church gives us a lens, I think, into what that might look like. Paul has, I’m fairly certain, what we might call a “political” meaning in mind as he writes this passage. In verse 8 Paul alludes to Psalm 68, which describes God as a conqueror who returns from battle victorious and whose enemies are forced to pay tribute. Paul uses this to craft a “logic” for the incarnation: in order for God to defeat the forces of evil in this world, God has to come to this world. But Paul also puts a twist on the quote: instead of forcing the conquered people to pay tribute, Jesus leaves us with gifts. The military metaphor wouldn’t be lost on people living under the mighty arm of the Roman Empire. And the subtle twist — giving gifts instead of exacting tribute — shows us something of the kind of counter-culture that Paul is imagining the church representing. Rome exercised control through conquest, and it never tired of reminding the conquered that they were not true Romans. What united the Empire was the force of Caesar’s Army and the fear it commanded. In contrast, what united the people of the church was a common bond of peace: called by the Spirit in one hope, united as one family with one Father. Instead of being ruled by fear and power, the church is to be a place marked by humility, gentleness, patience, and love. Paul is describing a society with a different value system from the world. And he is intentionally contrasting it with the brutal, harsh values of the Roman Empire in his days. If Rome was marked by the power of force and fear, our American society today is marked by the power of wealth and competition. The winner-takes-all brand of American politics and capitalism lends itself more readily to deceitful power-grabs than to honesty and compassion. And the never-ending competition for success and advancement lends itself to self-promotion and instant gratification more than it does to humility or patience. Give us bread, we demand with the people of the crowd. But what would it be like for the Church to lead the way in establishing a totally different culture? In our society, “faith” has been compartmentalized into a once-a-week (or less) activity. It’s something we consume when we need it, preferably on a Sunday morning before noon, but it has little intersection with the rest of our lives. By treating it as a commodity, it becomes subject to the same forces of competition that govern everything else in we do. Time is our second currency in this society, and when time is too tight we make cuts and we prioritize. Those of us who are leaders in the church are wrapped up in this story too: to convince people to “buy” our product with their time we endlessly toil to create the best “user experience” and greatest “value proposition,” evolving ever more elaborate “church programming” in an attempt to stir up interest and make church into something worth spending time on. But what if we approached this differently? What if instead of a commodity to consume we experienced faith as a means of connection through which we engaged with the rest of the world? Perhaps because it was sitting next to me while I was writing this sermon, the metaphor that comes to my mind is with our smartphones: tools that for many of us have become so integrated into everything we do that they define the ways we communicate with others, the organizations we do business with— I don’t ever go out to eat without looking up the restaurant on Yelp using an app on my phone—, and how we learn about our world. These little devices don’t just serve a single purpose, we don’t schedule a particular set of time for when to use them and put them away the rest of the time, and they don’t have to “compete” for our time and attention because we use them to do everything else we do. Could faith somehow work that way? Paul’s description of a community, or a family, of faith in Ephesians sounds less like an “activity” to me and more like a set of connections. Our families have profound influences on us, shaping the way we talk, act, relate to others, think about the world, and more. We can’t fit a family in the palm of our hands the way we might a smartphone, but it similarly establishes a set of connections and a way of connecting with others that permeates every aspect of our lives. Our faith can work this way, too: by providing us both with a set of connections — the people of faith sitting in this room and those who aren’t with us today but are united by our common bond of peace— both a set of connections and a way of connecting — a way marked by humility, gentleness, patience and love. Those connections and that way of connecting can, if we let them, permeate every part of our lives. Looking around this room and thinking about our community here at Saugatuck, I know that many of the connections we have with one another extend well beyond our time together on Sunday mornings. If we continuously expanded those connections and deepened those relationships, if they became as integral to our lives as our families or our smartphones so that they influenced the way we talk, act, relate to others, think about the world, and go about our lives, if our faith and our community of faith can extend into our lives in all these ways, then we will succeed in changing faith from an “activity” where we might choose to spend our time into a way of living that permeates every use of time. If we do this, if we model this kind of “intentional community” united by a common bond of peace and spirit of love, then instead of attempting to capture the attention of a society dominated by wealth and competition, we will be modeling one built on generosity and compassion. And if we can do that, I am convinced the church will not be playing catch-up: we will be leading the way and transforming our world.